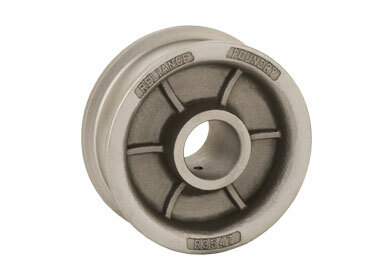 Reliance Foundry’s industrial wheels can be used for a variety of rail applications. High-quality metals and precision design support long-lasting performance and productivity—ensuring the best value with the least servicing and maintenance. Small rail installations support high-capacity loads with smooth and controlled transferability. Single and double flanged metal wheels are available for commercial and industrial operations—including lumber kilns, material transfer vehicles, marine tracks, cranes and factory or mining carts. Double flanged wheels ensure the best in safety and operations for rails with inconsistent geometries and/or signs of damage or wear. Reliance Foundry’s double flanged wheels are designed for use in commercial wood-drying kilns, but many commercial and industrial sites also require double flanges for more secure operations—especially where heavy, high-impact or uneven loading is common. 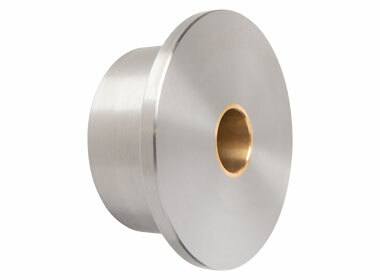 Double flanged wheels are ideal for kilns, cranes and other industrial loading vehicles. They provide the best means for keeping carts on track for long-term use. Heavy duty steel cart wheels provide optimal strength and durability for transferring heavy loads safely and efficiently. Compared to cast iron, which is brittle and more susceptible to fracturing, steel offers more elasticity—making it highly resistant to breakage while ensuring minimal wear for both wheels and rails. Inferior metals and/or manufacturing can lead to off-gauge configurations, wheel slippage or hazardous tread wobble—which can also create unnecessary vehicle and track wear. Using cast or forged steel wheels for heavy industrial loading ensures minimal need for replacement—and fewer service disruptions. All Reliance Foundry wheels are inspected throughout production and are tested to ensure each wheel delivers the utmost in quality and performance. Don’t see what you’re looking for in our standard, in-stock products? Reliance Foundry will design and manufacture custom wheels for specific applications. Fullcustomization services include consultation, design, prototyping, manufacture and shipment. Our experienced design staff is available to help identify the most suitable materials, pattern designs and manufacturing processes to ensure the best value and performance based on intended applications and volume requirements. For more information, contact Reliance Foundry’s Sales Department. Add an additional 25 percent of the total weight (vehicle and load) to allow a margin of error. Divide the total weight including the additional 25 percent by the number of wheels supporting the cart. The resulting number must be lower than the SWL of the wheel you intend to use. Note: Identifying load requirements in this manner will only determine capacity for a wheel at rest. Other factors such as but not limited to the positioning of a load, travelling speed and other adverse operating conditions can affect wheel performance. For specific operations, an engineer should be consulted to determine suitability. All standard, in-stock products are shipped within 1–3 days from our head office. 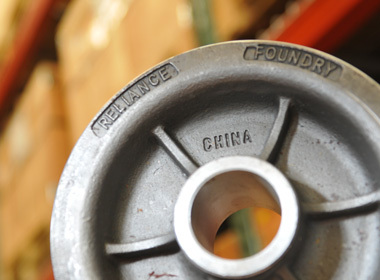 For specific shipping times, request a formal quote or contact Reliance Foundry’s Sales Department. Reliance Foundry has produced heavy duty wheels for a range of industrial applications in the forestry and mining sectors for more than 90 years. Our knowledge and experience ensure the ongoing quality and dependability of all industrial wheels for lasting performance beyond industry norms.